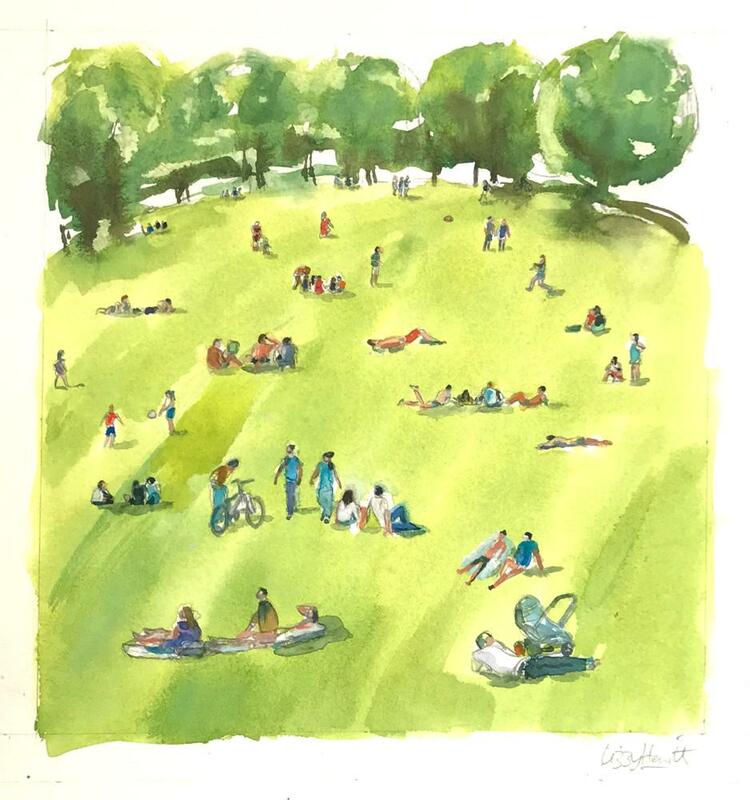 Lizzy Hewitt is a local artist who has been using Victoria Park as a place to develop her painting style using the natural features of the park to create expressive landscapes. This illustrates one of the many ways in which local people use the park and value what it provides for the local community. Lizzy writes below about her background in painting and the part Victoria Park has played in her development as an artist. Hi, I’m Lizzy Hewitt. I’ve lived in Leicester since I was a kid. I recently became inspired by Urban Sketching and the Urban Sketching community, which is a global community of artists who practice drawing on locations in cities and towns. Through sketching and photographing around the city I’ve been putting my own distinctive and personal mark on many drawings of iconic buildings and local landmarks. The great thing about urban sketching is that anyone can do it, it’s not expensive and you can do it on your own at any time. You also don’t have to draw iconic buildings. Much of the energy of our cities and communities can be found in everyday places. Even the local toilets if they’re important to you! Victoria Park is literally on my doorstep, so when I wanted to develop my style and subject matter into expressive landscapes, it was easy to reach and as I don’t own a car at the moment seemed the obvious choice. Victoria Park reminds me of a mini version of Central Park in New York City. Wide expanses of grass with tree-lined pathways, a confined haven away from the bustling city and a quick get-through for locals on their daily journeys. 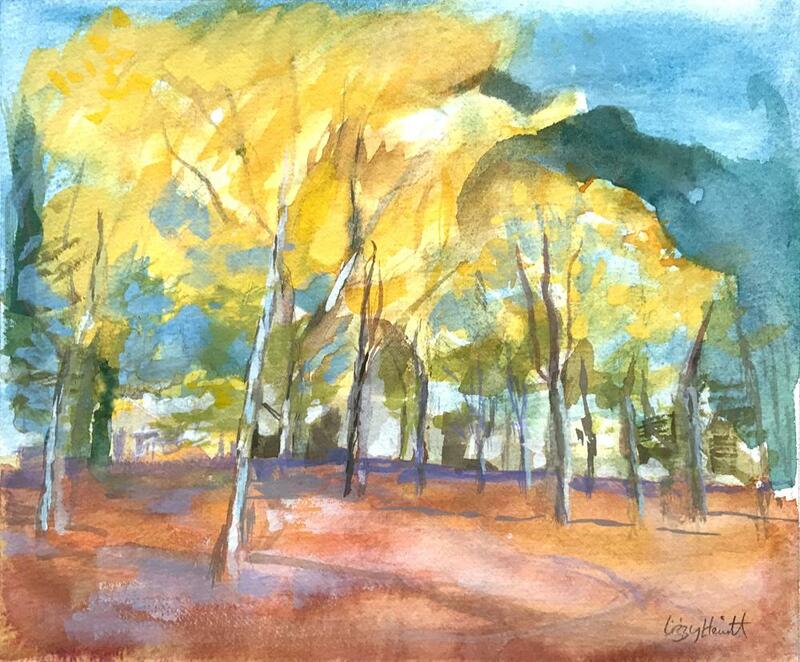 City parks provide many liberating and expressive opportunities for the sketcher. There are lots of viewpoints, an abundance of textures and a whole lot of opportunities to make a mark. The ever-changing seasons are captured here which are not seen when drawing buildings. I can draw a scene, or even focus on a single tree and record its changes over the different seasons. I find that it’s important to be different, so rather than taking a representational approach recording simply what is there, I use interpretations of trees, for example, in a more expressive, abstract and poetical way, following artists like Bonnard and Schiele. Many other painters have chosen parks as their subjects including Monet with his interpretation of Hyde Park London, or the recent artist Janet Ruttenberg who paints large canvases on Central Park. Although professionally skilled in watercolour my friend and painter Louise Ellerington encouraged me to take oil classes at her Clarendon Park studio. For my first attempt I had drawn a line of trees, and although the foreground was textured there was something lacking in the painting as a whole. Later the perfect composition came one summer day when walking through the park. Sunbathers were out soaking up the rays, and I now had my foreground. I always carry a camera so I eagerly snapped away over the next few sunny days. The final result, Sunbathers, was picked for the Cank Street Gallery Summer Show. My later autumn lime tree painting ‘Tall Limes’ is now also in the Cank. Why not go along and take a look. You could always buy one if you want to support a local artist! They’ve already sold several paintings of mine including The Sacre Coeur, Paris, and Leicester’s famous Turkey Café. You can find out more about my work here or visit the gallery here, and if you are interested in Urban Sketching take a look at here.